Hello! Today's post is the last post of our holiday vacation in Pensacola Beach, Florida. If you missed all my other posts, just scroll down. After spending the morning in downtown Pensacola, we had a leisurely lunch at a chain restaurant (which was not MY choice, but my families. I always prefer local restaurants when traveling, but after three days of tasting local cuisine, they were ready for something more familiar----like Applebees! 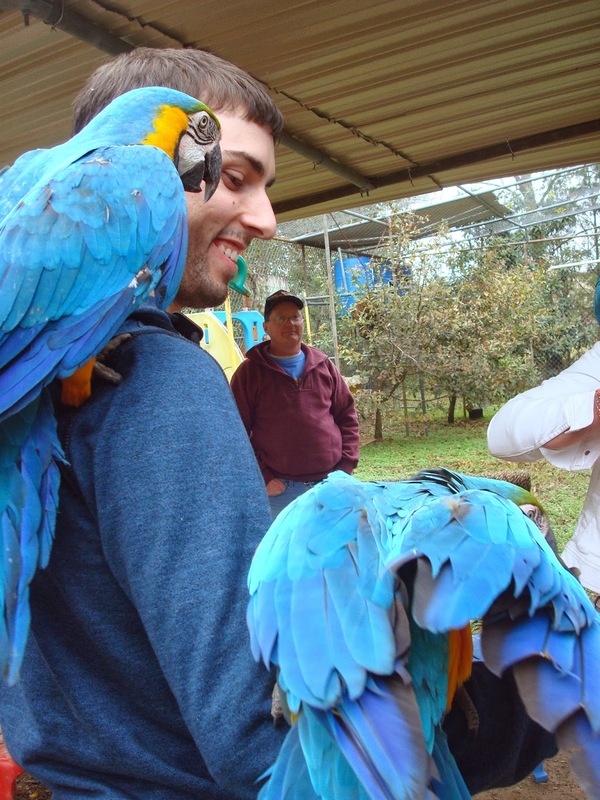 ), and then we went to visit Uncle Sandy's Macaw Bird Park. This is a non profit animal shelter which is located in the back yard of a neighborhood home. The house has been turned into an office building, and the backyard is a conglomeration of cages filled with mostly Macaws, but many other species of tropical birds as well. Now we are a bird loving family and have at one point owned as many as five birds at once. Now we only have one bird left, a cockatiel, but we have a lot of experience handling birds so we feel very comfortable around birds. Because of our comfort level around birds, we had a BLAST at this park. It costs $5.00 per person to enter the park, but they give you bread and peanuts to feed the birds. I really marveled at the color in these animals. Just gorgeous. Each bird had such a different personality: some were shy, some were very friendly and inquisitive; they were all so fun to get to know. Most of the park has smaller cages (for some of the smaller birds), but there is one section where you can actually enter the enclosed cage and feed the birds. That was our favorite part! 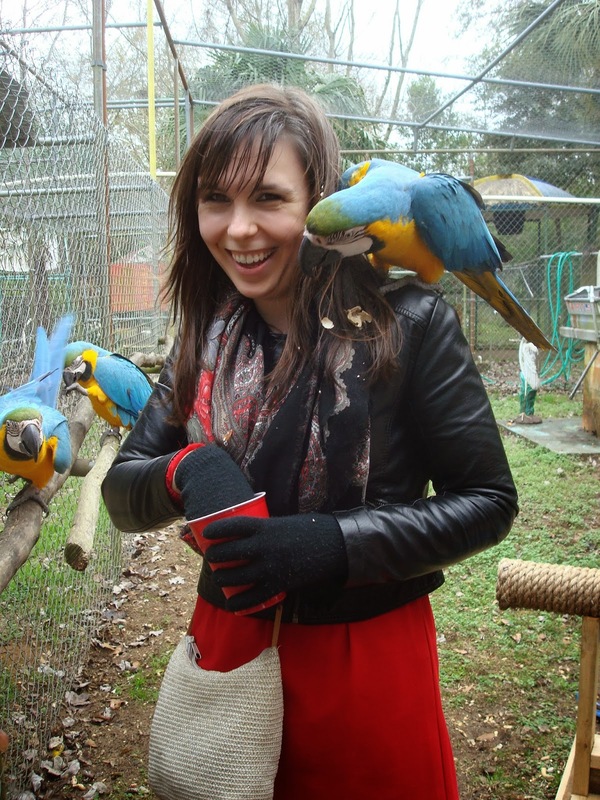 At first it was a little intimidating because these birds are quite large and have quite big beaks, but we found them so sweet and friendly, we quickly got over our fears. The birds will land right on your shoulder, arm, or even your head to get some peanuts. Thankfully, none of us got pooped on. This is my husband feeding the birds below. I like how the one Macaw just sticks his head right in the peanut cup! Did you notice the emus behind my husband's head? Here I am having the time of my life feeding these beautiful creatures. There was a shy one just above my head that you can't see that wouldn't come down so I had to keep feeding him peanuts through a small opening in the cage. It was so nice to see this smile on my son's face. He's a melancholy artist type, so to see this type of pure joy on his face is rare. He loves birds and animals, and this was such a treat for him to get up close and personal to these animals. Anytime he sees a pet store, he loves to stop and visit the birds, but they rarely let you touch the birds in a pet store, so this was a wonderful opportunity for him. My daughter got just a kick out of these funny little creatures. I have to tell you these birds make a lot of noise, especially when you first get to the park. There were two bird cages in the parking lot, and when we arrived, boy did these guys squak! My husband said, 'Wow, and that's just the noise of two birds! Can you imagine if you were in a forest and heard a flock of them making that noise?" I just noticed all my photographs are showing the blue birds, but we saw lots of other colorful birds as well. I thought the red birds were so pretty. Uncle Sandy's takes in unwanted and abandoned birds and gives them a home. Many people buy large birds on a whim not realizing how much care and attention they require and then decide they no longer want them. 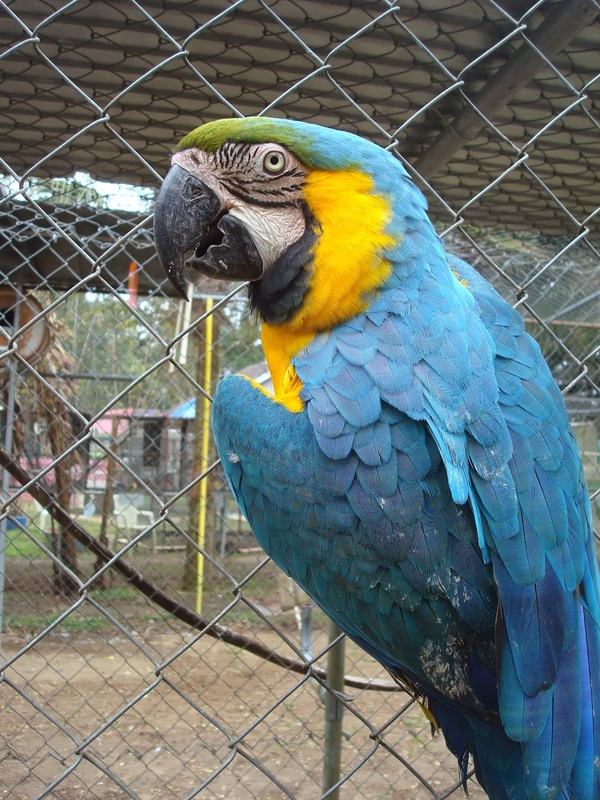 Macaws also can live very long, up to 60 to 80 years! So often, the owners either die or move into a assisted living home and can no longer care for the bird. Uncle Sandy's provide's a happy home for the birds to enjoy and a wonderful place to visit for the bird lovers like us. If your ever in the Pensacola area, stop in and feed the birds! Nice pictures and the birds are beautiful, thanks for your visit and comment on my blog. Such amazing birds and gorgeous photos. I can tell you all had a fabulous time there! Thanks so much for sharing your vacation photos, really enjoyed reading your posts! Love these pic's and aren't those birds wonderful!